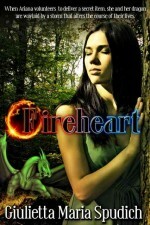 A strong, intelligent eighteen-year old, Ariana is frustrated by her inability to contribute to her forest band as she is chained to a large, though friendly, dragon. She suffers an unrequited love for attractive Alex, an older blacksmith. Having lost her parents in a fire, she feels she has nothing. She must team up with Alex, who she no longer trusts, but still has strong feelings for, to save her dragon and to keep the secret of the Light People from the human race.